Since moving to london from Spain (in the worst winter for twemnty odd years) I have been living on roast vegetables. I am virtually a vegetarian and tend not to eat much meat. However I miss my salads as well, so this roast pumpkin salad ticked all the boxes. A perfect lunch when served with wholemeal bread. On a large baking sheet, toss together the pumpkin, onion, and oil, and then season with salt and pepper. Roast for about 20 minutes until the pumpkin is tender but not mushy. 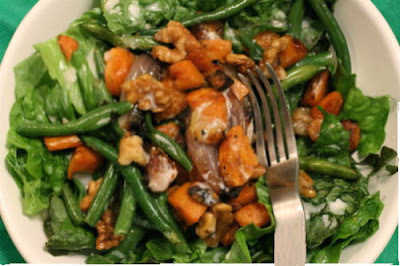 Add green beans and walnuts and toss well. Roast for three minutes To make the dressing whisk together yoghurt, vinegar, and garlic and season with salt and pepper. Top the lettuce with roasted vegetable mixture and drizzle the dressing over the top.